Mirillis puts the security of data which is send through Monflo and privacy of its users in the first place. We have implemeted all necessary security measures need for comfortable and secure use of Monflo. Here you will learn how to authorize Client devices. Logging into Monflo Server application on your PC is possible only with a user name and password you have given while creating your Mirillis Account. If you don’t have Mirillis Account see Account Creation tutorial. Monflo includes security features to keep your PC, privacy and data safe. To protect your PC against unauthorized connections every device, both Android and PC, that connects to your PC for the first time must be authorized. Only authorized devices can connect to your computer and remotely control your PC. To authorize a device you must accept device authorization on your server PC. Important information: To make your PC secure please remember to keep your Mirillis account username and password safe and do not confirm authorization for unknown mobile devices. 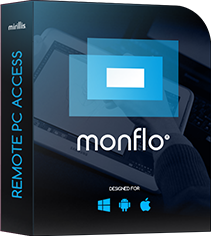 At any time you can clear all authorized devices using “Clear all devices” button available in Monflo Server - Settings tab. No Android mobile device will be able to connect to your PC until you authorize it again.